Although she belongs to a high family. We return this month to the repertoire of Michael Cassius Dean whose version of “The Brown Girl,” shown above, was transcribed by collector Franz Rickaby when he visited Dean’s home of Virginia, Minnesota in 1923. 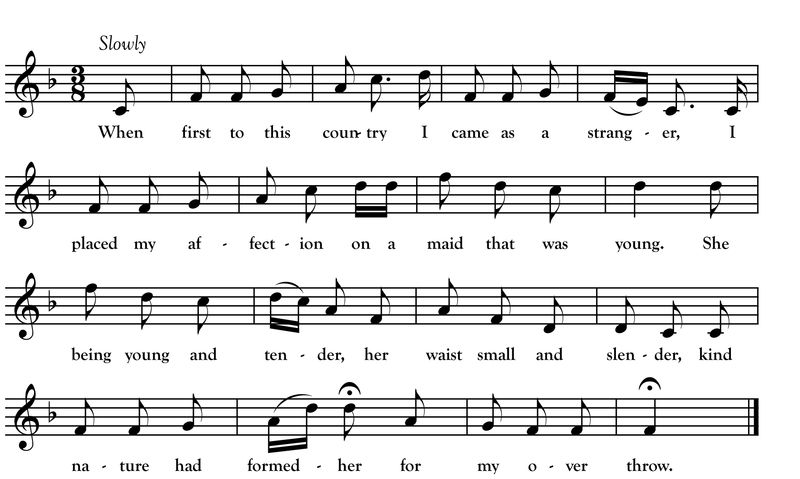 Much less gory than the older English ballad of the same name, Dean’s “Brown Girl” is a 19th century broadside ballad also found in tradition in the Canadian Maritimes and Ireland. As I have familiarized myself with Dean’s repertoire (more than 160 songs) over the past several years of research I find myself drawn to his songs that evoke something of his life here in Minnesota. I love this text for the image of “blood upon snow”—a striking description of rosy cheeks that fits with Dean’s snowy home. There is a lot more of Dean to come in 2016! Next month marks the launch of the “Lost Forty Project”—my year-long effort publicize and revive forty forgotten field recordings made of Minnesota-based traditional singers in 1924 by Robert Winslow Gordon. Thirty of the recordings are of Dean and they will all soon be made freely available on a website I will be creating! Stay tuned for more!